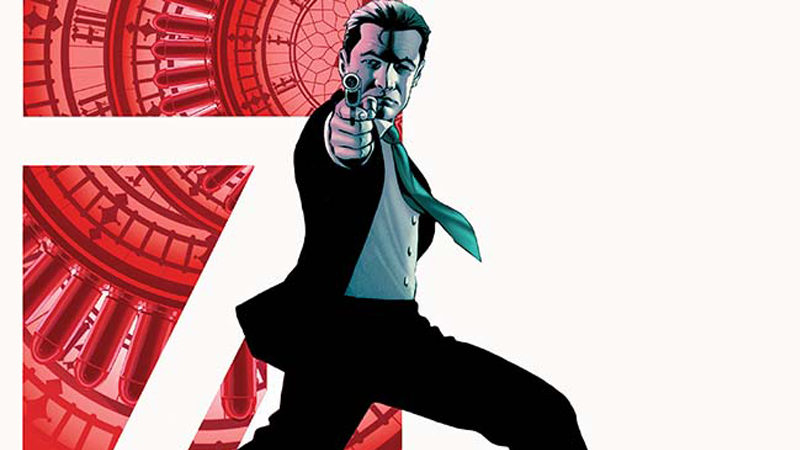 Warren Ellis’ time with 007 at Dynamite Comics has come to an end, but the life of Britain’s premiere special agent goes on. Green Arrow’s Benjamin Percy is sending Bond off on new missions to new locales, and we caught up with him to see whats in store for MI6's finest. Although starting out with its own new #1, James Bond is still set in the continuation of Dynamite’s first, Fleming-estate-approved run with the character that began in late 2015. That means that although there’s a new creative team—Percy is joined by artist Rapha Lobosco—it’s same old, same old for Bond... at least in the sense globetrotting spy missions can be “same old, same old” for anyone. While on the hunt for an assassin who targets other assassins in the French Alps, “Black Box” will see 007 drawn into a global threat to cybersecurity that takes him across the world in an attempt to safeguard not just Queen and Country, but the digital secrets of the world. Check out our full interview with Percy below, as well as a preview of Bond #1.
io9: What’s your history with Bond, on screen and off? Ben Percy: I grew up on Bond. My father and I dutifully sat through every 007 marathon on TBS, and I don’t think I’ve never not seen the latest installment with him at the theater on opening weekend. He traveled often for business, and to this day, we have a running gag about him being a spy. He has quite the arsenal, and he bought a Walther PPK that we’d fire at the gravel pit. In high school, when taking a career test, I jotted down “international man of mystery” as my dream career. In college, I took a course called the Spy Novel, during which I was introduced to Erskine Childers, Graham Greene, John le Carre, and Ian Fleming. From there I worked my way through the whole Bond library. In other words, he means a whole hell of a lot to me—on a personal level, since he’s been such a constant in my life and since my sense of story has been profoundly influenced by him—so this opportunity to write the series feels like an incredible gift. What do you hope to bring to Bond in the wake of Warren Ellis’s run? Percy: Warren went dark, cold, gritty—a brutalist style of Bond I love and admire. He made that tonal contract instantly clear when he opened the series—in the shadows, in the winter, with Bond hunting a man and taking him down with a shovel. Timothy Dalton was the darkest Bond of the films, and he could have starred in an adaptation of Ellis’s work. Warren is a hero of mine, and I feel lucky to now call him a friend. I hope people don’t spend too much time looking at my work beside his, because I’ll always be the cross-eyed, mouth-breathing, knuckle-dragger by comparison. If you want to make a parallel [to the films]: I’m perhaps channeling a little more Connery and even a bit of Moore. There are certainly some dark moments in my opening arc, but I think it will be very, very clear that I was grinning like an idiot when writing these scripts. There’s plenty of mystery and menace—but it’s all laced with humor, sexiness, and—no other word for it—fun. I’m having so much damn fun, and so is Rapha Lobosco, the artist I’m collaborating with. The emails we exchange contain many exclamation marks. He’s a rock star in the making, and I know our combined storytelling energy is going to infect the reader. Every issue will feel like a shot of adrenaline to the jugular. What can you tell us about your first arc on the book? Percy: Let me fire off a few rounds, see if you startle! An assassin who only kills other assassins. A wild, wintery ski chase in the French Alps. A secret casino—where the stakes are deadly—located deep beneath a city. A sumo wrestling tournament in which the fight extends beyond the arena. A cat-and-mouse game in the “suicide forest” at the base of Mt. Fuji. I could go on, but, you know… spoilers. Exotic locales. Dangerous seductions. Colorful villains. Nifty gadgets. I’ve got in all in there. Every few pages reveal a new twist, another layer of mystery—and every issue is organized around a wild action set-piece. Can you tell us anything about the characters Bond will meet in your first arc? And will you be exploring more story with Bond’s supporting characters back at MI6, too? Percy: Oh, I couldn’t ignore the gang at Vauxhall Cross. Writing them felt like visiting old friends. Boothroyd (who film fans know as Q) plays a particularly important role. I’ve always had a special fondness for the henchmen, so I put a lot of thought into building a memorable, grotesque, wild character. So get ready for NO NAME—who collects and wears the death masks of those he hunts and kills. Our Bond girl is the ultimate badass. I won’t say too much about the big bad of the story, but as expected, he’s a megalomaniac with nasty intentions and a physical deformity. This series has transplanted a very old school Bond into the world of 21st-century spycraft. What’s do you think is the biggest challenge in bringing cyberwarfare and counterterrorism to a classic character like Bond? Percy: Bond stories usually capture the anxieties of the time. Look at Javier Bardem in Skyfall—and you see, in his floppy yellow-white hair, an obvious nod to Julian Assange and Wikileaks. Dr. No was born out of the Cuban Missile Crisis. You Only Live Twice tackles Cold War paranoia. These days, we’re all vulnerable online. It’s so easy for us to be digitally taunted, stalked, possessed, even erased. You see it (on a larger scale) with the Russian hacking of the US election. And you see it (on a smaller scale) in our daily lives, when the credit card company calls and asks if you bought five thousand dollars worth of diamonds in Brazil or when your laptop slows, clogged up with a Trojan you accidentally downloaded. So I’m writing a story relevant to the right now—about cyber terror. But, you know, people tapping at keyboards and staring at screens aren’t visually interesting… so rest assured, I throw in plenty of explosions and sharks and fistfights. Albeit in very different contexts, there’s been an element of spy-fi to Green Arrow, which you’re writing at DC. If in some far off alternate universe your Ollie and your Bond ever teamed up, what would they think of each other? Percy: Yeah, that two-issue Green Arrow arc involving the underwater railroad that runs beneath the Pacific Ocean, linking Seattle and Shanghai… that was straight out of the 007 playbook! James Bond #1 is set to hit comic book shelves on March 1st.